Mounting to wall: The cross is embedded into a custom cut bed of museum grade foam. Evidence of use in field: rot to base which may be consistent with use in field. The museum is on London Street in Swaffham, a market town in West Norfolk on the A47. There is plenty of parking, The museum contains exhibits rom the Stone Age to the modern. Home of the Symonds collection of figures based on characters from literature. Local heroes include Howard Carter, the archaeologist, Admiral Sir Knyvet Wilson, Jem Mace, W E Johns and the Swaffham Pedlar and a display on RAF Marham, which includes information on the refuelling of the Vulcan bombers during the Falklands war. It is well worth a visit. The cross is kept in the first room on the left as you enter opposite the shop. 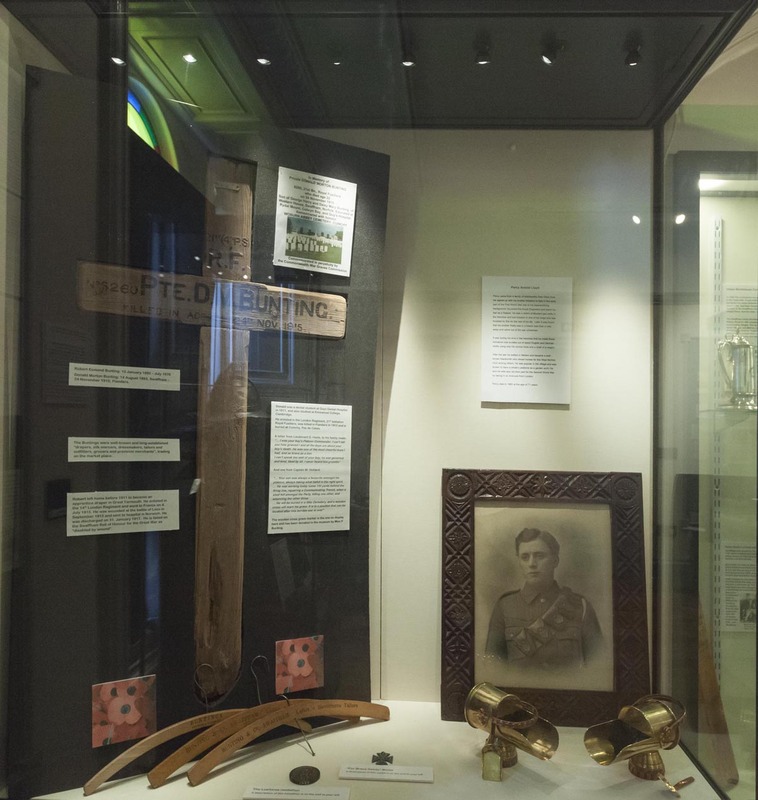 It is in a display that covers lots of nformation about local families and the local men and their involvement in the Great War. 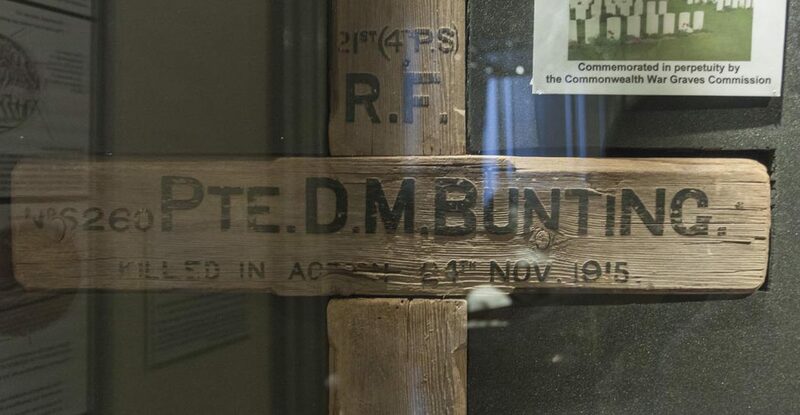 Donald Bunting’s cross was donated to the museum by Ms P. Bunting. He was a medical student at Guys Dental Hospital and also studied at Emmanuel College Cambridge. 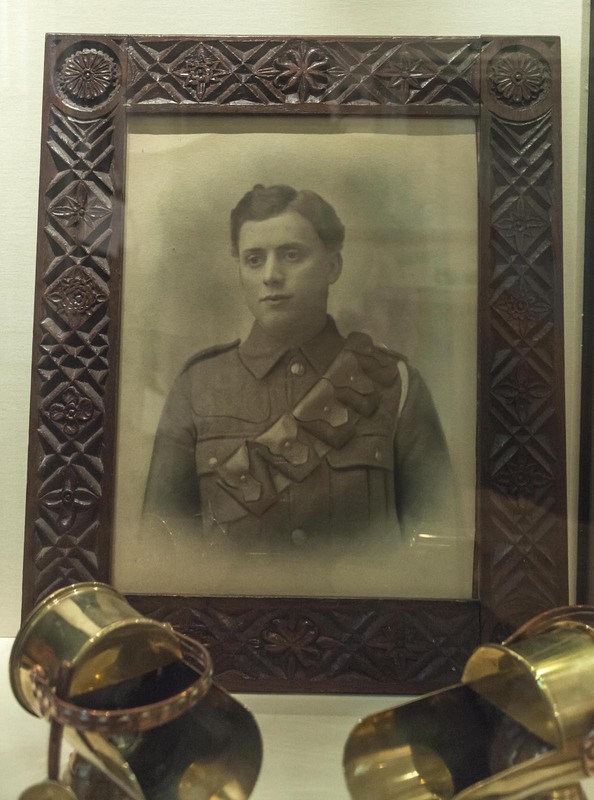 He enlisted in the 21st Battalion Royal Fusiliers (London Regiment) He died in Flanders on the 24th of November 1915 and is buried at Cuinchy in the Pas de Calais. His brother Robert was disabled by a wound at Loos and sent home to recover in Norwich, he was discharged from the army in 1917. He too was in the London Regiment (14th). The Bunting family were well known locally as a family of drapers, they had a store in Swaffham and I believe are related to the Buntings of Norwich who ran the large department store in Rampant Horse Street where Marks and Spencers now trades. Donald Morton Bunting: 14 August 1893, Swaffham – 24 November 1915, Flanders. The Buntings were well-known and long-established “drapers, silk mercers, dressmakers, tailors and outfitters, grocers and provision merchants”, trading on Swaffham market place. Donald was a dental student at Guys Dental Hospital in 1911, and also studied at Emmanuel College, Cambridge. He enlisted in the London Regiment, 21st battalion Royal Fusiliers, was killed in Flanders in 1915 and is buried at Cuinchy, Pas de Calais. “… I was your boy’s Platoon Commander. I can’t tell you how grieved I and all the boys are about your boy’s death. He was one of the most cheerful boys I had, and as brave as a lion. “… Your son was always a favourite amongst his platoon, always taking what befell in the right spirit. … He was working today some 150 yards behind the firing line, repairing a Communicating Trench, when a shell fell amongst the Party, killing one other, and wounding the other three. His brother Robert left home before 1911 to become an apprentice draper in Great Yarmouth. He enlisted in the 14th London Regiment and went to France on 4. July 1915. He was wounded at the battle of Loos in September 1915 and sent to hospital in Norwich. He was discharged on 31. January 1917. He is listed on the Swaffham Roll of Honour for the Great War as “disabled by wound”. 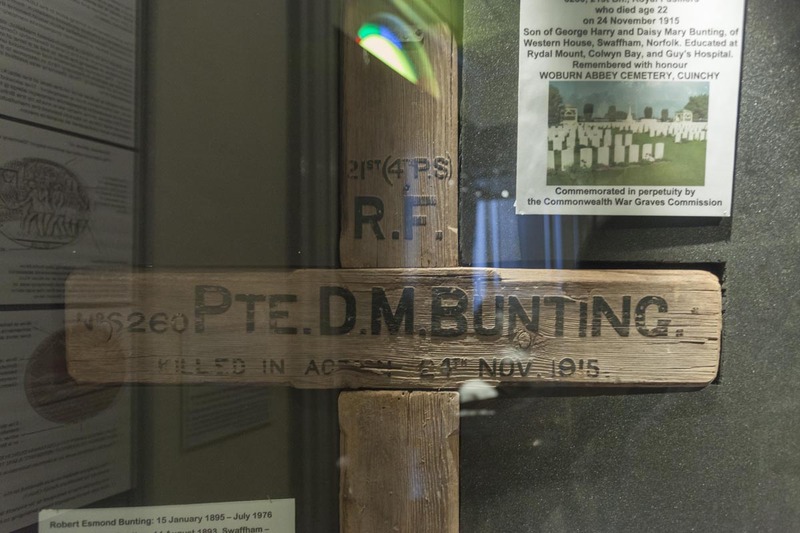 The wooden grave marker, donated by Miss P Bunting, is on display at the museum and will be highlighted in the permanent Military Gallery to be launched next year. The 21st Royal Fusiliers were assigned on 21 November 1915 to the trenches immediately south of La Bassee Canal to be attached to the 2nd Worcestershire Regiment for training purposes. On 24 November 1915, a German rifle-grenade burst upon a trench where a party was working on repairs and improvements, killing three men – Pte 6260 Donald Morton Bunting, Pte 2689 John Felix Frith, & Pte 2984 William Trevor Morgan – who were interred at Woburn Abbey Cemetery, Cuinchy.